The majority of people rent at some point in their lives for various reasons. In the ideal world it should provide you with affordable, well maintained accommodation with the freedom of no mortgage or long term commitment. 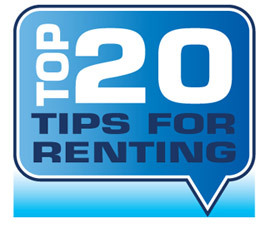 Unfortunately there are also some unscrupulous landlords / agencies out there – try using our handy top 20 tips for renting in Leicester to avoid any problems. 1. What do you really want and what can you afford? 2. When should I start looking? The majority of property on the market to rent is available immediately or within the next couples of months. If you are looking for a property several months ahead you will generally struggle. Many agents have waiting lists / mailing lists that you can join to keep track of new properties coming to market. Cast your net wide and check out the whole market from high street estate agents, to property management agencies and private landlords. This will give you a good understanding of what you get for your money in that area. Take your time to see if there is a shortage of the kind of properties you want to rent. Be willing to compromise. Make sure if you deal with an agent they belong to a professional organisation such as ARLA, NALS, NAEA or RICS. The internet is a great place to start with Gumtree, Find a property etc websites being a good place to start. Try your local paper which will have an accommodation to let section. 4. Should I go for furnished or unfurnished? If the flat is furnished, check what will be staying when you move in. If you arrive to your new flat after work and discover the curtains weren’t part of the deal you could spend your first night in your new flat kept awake by street lights! Don’t be put off by unfurnished properties. The cost of key items has dropped dramatically with companies such as Ikea, Argos, Tesco and Asda offering some amazing deals. You have the benefit of paying less rent, know the items are new and yours at the end of the tenancy. Investigate bus routes, local facilities etc. You may find cheaper property further away but with great bus routes to your work / university. If you know someone already living in the area ask them to show you around the town to give you an idea of the parts of town you might like to live in. Alternatively take to the streets: spend time walking the area where you want to live and at the times you will be around to ensure you are happy with security and convenience. Your monthly rent, usually paid one month in advance. Additionally bills such as water rates, utility bills, council tax (check what band your property falls under), communal community charges etc. Never provide your personal banking details over the internet. Once contracts are signed exchange these details in person and insist on receipts for any money you hand over. Make sure that you find out all charges payable in advance. It helps to have cleared funds available for use immediately in case you need to secure a property quickly. You can usually use a bankers draft, building society cheque or cash. Some take credit cards now too. Agents Fees: You may need to pay an agent’s fees, this is the fee for the agent putting you in touch with the landlord and the admin carried out by them in relation to the agreement. Holding Deposit: You may have to pay a holding deposit on application via an agent or landlord whilst your tenancy application is being processed. It is vital that you get a receipt for any money that changes hands. You should get written confirmation of the terms of which you will, or will not get your deposit returned, should your application not be accepted or if you change your mind. Damages Bond: You will normally have to pay a damages bond or a deposit on the property which that landlord will hold in case of any damages during your rental period. This should be returned within two weeks after your tenancy ends. You are not required to pay a fee to view a property. This is illegal. 7. What documents will I need? Before you start negotiating with a landlord get all of your references in order. References could be from your a previous landlord if you have one or an employer. You may also have to supply bank references. You will need to prove that you have a stable income. Good reports from a previous landlord may help you to secure a property. Many agencies use a credit Search Company and usually make a charge based for this. The credit search company reserves the right to charge for a Guarantors reference in addition and this will be charged out at the normal applicant rate. Make sure you quiz your agent about fees for references and credit checks. A credit reference should cost around £30 - £40. Guarantors may be required – which usually means a UK homeowner acts as a guarantee that you will pay your rent should you default. 8. What paperwork do I need to sign? The devil is in the detail! Read the small print. Don’t be rushed into signing an agreement, and ignore the assurances of landlords who say it’s just a formality. One of the common reasons for tenants losing deposits is overlooking clauses on cleaning and maintenance. If you don’t understand something in your agreement ask for it to be explained. For furnished properties insist on completing an inventory signed by all parties as soon as you move in, and use a digital camera to take photos of any imperfections. You will need to sign a shorthold tenancy agreement. Make sure that you and any tenants you are sharing with read and understand it. Get clarification of any points that are unclear. Know your obligations. All tenants will need to sign the tenancy agreement before moving in. Know your rights – did you know that you have a legal obligation, as a tenant, to have viewed the property before signing a lease? If you require any form of release clause that varies from the standard agreement make sure this is noted and agreed by both parties. 9. What should I double check? How much notice must you give the landlord? Which rooms are being let? Which facilities are being shared? How the rent is due? The agent will have certain obligations but these may vary from simply letting the property to letting and managing the property. Find out what the agent’s responsibilities are. If they are simply responsible for letting the building, find out who is responsible for managing / maintaining the property. Get copies of all relevant safety gas and electric safety certification. If there has not been a gas safety check in the last year do not move in! The landlord is legally obligated to have annual safety checks carried out. Maintenance issues should be dealt with promptly. Don’t be shy reporting problems, the landlord / agency won’t know unless you tell them. A good landlord will appreciate knowing if something needs doing – after all it’s their investment you live in. Contact the owner / landlord who will generally be responsible for maintaining and or repairing the fabric or structure of the property. This normally includes domestic appliances and furnishings if provided. Ensure you check the agency / landlords maintenance levels response times as this can be a real headache once you have moved in! The quicker you report a problem the sooner it can be resolved – so don’t hesitate to get in touch with your landlord or agent. To make repairs your landlord / agency will need access to your property, of which legally they need your consent. If you can be compliant with this the repairs will get done sooner rather than later. In the case of an emergency (such as a burst water pipe) the landlord / agent can enter without notice under the terms of the contract. Choose flat mates carefully! A recent poll by Gumtree.com found that Jamie Oliver is the person people would most like to live with. Over a few drinks with good friends you might decide living together is a great idea, but if all goes wrong, it may cost you a lot more than you think, including your friendships. Start by agreeing who you want to live with, what your budget is, and what area you’re looking in. Don’t forget the hidden costs of renting such as council tax, bills and commuting expenses. Money is the number one argument – so if you do share a house, try to make sure your bills are your own and you don’t need to squabble over them ever month. Or alternatively rent a property that ensures you keep your bills as your own even though you are sharing facilities. Modern bedsit options are a great example of these. When sharing your property you are all signing the same tenancy agreement. This means you are all liable for the payment of the rent. If one person leaves you will still be required to pay the full rent for that month. Alternatively ensure you have your own tenancy for your own room such as bedsit style tenancy. Take Time Viewing your property using a checklist of what you are really looking for in a property and what you will compromise on. For example parking may be a must, where as you may have more flexibility on the location as you have a car. Stay safe and always take a friend with you when viewing a flat, or let someone know where you will be and when. If you’re planning to share with friends it’s tempting to trust their judgment, but the only true way of knowing what you’re singed up to is to see it first hand. The property should be clean and tidy and have a reasonable standard of decoration. The standards in the buy to let market have increased dramatically so make sure you shop around for your budget. Hidden potential. Don’t take a flat on face value. You may be viewing the property whilst it is occupied. Some tenants can stay with a good landlord for some time, when they leave most agents / landlords will renovate the property to their current standards. Try to imagine the space as your own, where you could put things etc. Compromise and challenge the landlord / agent. If you love the property but need more cupboard space / curtains etc. Try and negotiate with them, you may be surprised. Be wary of sales pressure when viewing properties. Make sure you have time alone to view without being pressurised to make a decision. 13. What are the tenant’s responsibilities? Once you sign your contract and move in you will be responsible for the property. Respect the property you are renting and treat it as you would your own. You should keep the property and its contents in good order so can be certain to get your full deposit back when you move out. Keep it secure and report any issues to the agent or landlord as soon as they arise. Try to be a considerate tenant within your building. Be respectful of noise levels and keeping the communal areas clean. Unless you have your bills included as per your contract, you will be responsible for them. Make sure you transfer the services into your name (ie electricity, gas, telephone, council tax, tv license, water rates etc ). You will need to contact the provider and in some instances may be charged a connection fee. Speak to your agent / landlord and they should tell you who you need to contact. Take meter readings if relevant. Find out what band you are in for your council tax. Remember a 25% discount is available if you are a one household occupant. Make sure you set up direct debits or payments properly for your rent and for your utility bills. Some charge late payment fees. It is your responsibility to take out personal contents insurance to cover your property and any damage you may accidentally cause to the property. Get a copy of a detailed property inventory for furnished properties. If there are photographs of the condition of the property and the garden make sure that these are dated by the landlord or agent. If you are not happy with something when you move in then take a photo and send a copy to the landlord or agent. Ideally the tenants should check, sign and return a copy of the Inventory to the Landlord or agent and confirm their agreement with it. If your property is furnished make sure the furniture has fire safety labels on it (armchairs, beds, cushions etc) and that a note is made on the inventory to that effect. A landlord has a legal obligation to provide a safe property for the tenants to live in. Specifically, this means that any electrical equipment provided plugs, sockets etc must be safe. You should also ensure that all equipment is serviced regularly and provide instructions or user manuals so tenants know how to safely operate appliances and equipment. Where there is gas in the property, the landlord in the UK must be law, provide a landlords gas safety certificate annually. 18. What happens if there is a problem after I move in? Your landlord / agent should be your point of contact for any problems that may occur. Keep a clear record of all your rental payments (standing orders are a perfect way to pay promptly and retain good records of payment) should there be any problems. Keep all your documents (such as insurance policy, copy of tenancy agreement and inventory) together in a file in a safe place. Leave the property in the same condition you found it. If the tenancy detailed no pets, don’t be surprised if you loose you deposit if the carpets smell of cats or the doors got dog scratches all over them! You may even be liable for the damage to be repaired if the damage exceeds the deposit. Take final meter readings for gas, electric and water if relevant. Make sure that you are present when the landlord or agent makes their final checks. If you are intending to vacate the property give your landlord the proper notice as per the terms of your agreement.